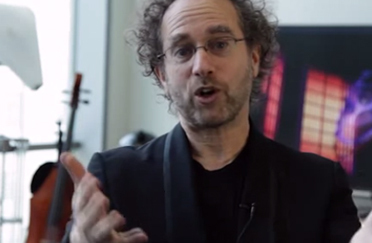 In addition to composing his own music, Machover is passionate about making music central to people’s lives — and many of the technologies he’s created do just that, from the technology behind Guitar Hero to Hyperscore, which lets anyone compose music using visual tools. Machover was also interested in creating dialogue between musicians and consumers of music, including the growing number of consumers who make their own musical mash-ups. “There’s really no dialogue between the artists putting out commercial stuff,” he said, and the people who are riffing off of it. At the same time, he observed, everyone uses social media — “you can’t be an artist without using it” — but “a lot of social media actually creates more of a gap” between artists and audiences. “You become more known, but you aren’t more accessible.” With the Toronto Symphony, Machover saw an opportunity to experiment with a new model of a collaboration with the general public. “Could I invite people into the creative process in a way that would be exciting to all of us?,” he wondered. 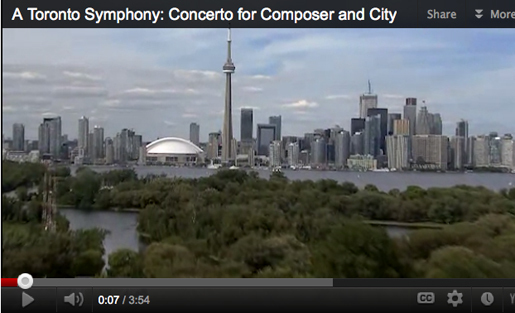 Hence, the collaborative Toronto Symphony project was born, with Machover formally inviting every resident of the city to participate, with a blog post (quoted at the beginning of this article) and video (see below). His approach offers inspiration for any organization looking to involve citizens in its work in meaningful, rather than token, ways. When he first started out, Machover never would have imagined that collaboration would be such a central theme of his career. In fact, back in college, part of what appealed to him about becoming a composer was the promise of solitary work. So what happened? In a word: technology. For the Toronto Symphony project, Machover designed a series of very specific challenges to spur residents’ participation, which he’s released — and continues to release (the next one’s coming December 6) — through the project’s website. For example, the first challenge he sent out “was a challenge to listen to the city,” inviting residents to notice sounds that struck them as typical of Toronto, or that they particularly liked or didn’t like; then, they could either record these sounds and submit them, or simply submit descriptions of the sounds, and Machover’s team would do the recording. In addition, Machover scheduled sessions in which residents could join him on a listening tour of the city. He compiled a library of all the sounds he collected (“there was a huge number of submissions,” he said), which he’s woven into a series of sound collages. He also recorded people saying things about Toronto in various languages — more creative fodder. In addition to issuing these general challenges, Machover has designed opportunities for collaboration that are targeted to individual groups and constituencies within the city. For example, when he learned about an indie rock festival in Toronto over the summer, he saw an opportunity to get that part of the city’s music community involved in the symphony project. He asked himself, “What would be the best way to catch their imaginations?” In the end, he invited each band to contribute a short piece of music (five seconds max — “one second is best”) that was a kind of immediate signature for their sound, and that represented something that could only be done in Toronto — whatever that meant to them. About three-fourths of the bands participated, and Machover plans to weave their sounds into the final composition. When it came to the city’s Youth Orchestra, Machover arranged for an in-person collaborative session. He played for the students a collection of recorded sounds he’d gathered earlier in the project; he then asked them to recreate the sounds of each recording using instruments. For example, after they listened to a recording made at one of the city’s beaches, he asked, “What instruments can we use to recreate the sound of the ocean?” Students spent only about 10-15 minutes on each recording. Like the indie bands’ signature sounds, the fruits of these sessions will be woven into the project’s final composition. Often, he observed, collaborations result in decisions made by committee — when this happens, everyone accepts the outcomes, but no one is excited by them. On the other hand, if the leader of a collaboration pushes too hard for his or her own vision, participants feel manipulated. Yet, collaboration leaders need to be careful not to let attention to other people’s ideas morph a project into something about which they no longer feel an authentic spark — when they do, they end up simply managing the project, rather than infusing it with their unique vision or personality. “Yours” is material created by the city’s residents; “mine,” clearly, is music that Machover himself composes. “Ours” is what they compose together. The combination of these three types of authorship promises to create something very rich, which strikes the balance Machover seeks between individual vision and collective creativity. Amanda Hirsch is the editor of Collaboration Central. She is also a writer, performer and social media strategist who lives in Brooklyn, N.Y. The former editorial director of PBS.org, she blogs at amandahirsch.com and spends way too much time on Twitter. Her latest project, Having a Ball Having it All, explores what it really means for women to have it all.